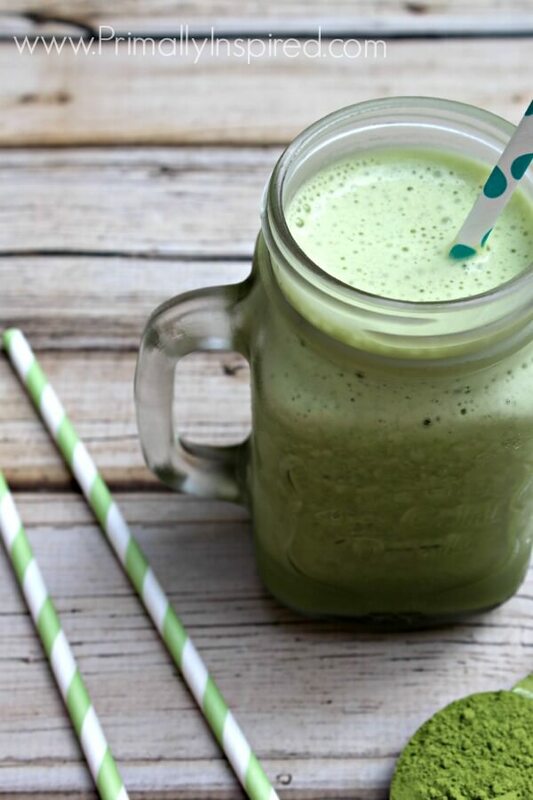 I wanted to give you guys my green tea frappuccino recipe because it’s something I drink and enjoy almost every afternoon for both the taste, the health benefits and the energy boost. I’m a long time fan of tea (some would call me obsessed if you saw my tea collection 🙂 ), but this matcha green tea frappuccino recipe holds a particularly special place in my heart. If you haven’t tried matcha yet, you are in for a real treat with this green tea frappuccino recipe. Not only is it super refreshing, but it comes loaded with health benefits (some even say it’s THE superfood of superfoods!). My husband and I can both testify that it will give you lasting energy (with no jitters or insulin spikes) for about 3 to 4 hours. We swear by it! If you’ve never heard of matcha, it’s the powder of finely milled green tea. The health benefits of matcha tea exceed those of green tea because when you drink matcha you ingest the whole leaf, not just the brewed water. One glass of matcha is the equivalent of 10 glasses of green tea in terms of its nutritional value and antioxidant content. You can find matcha prices range anywhere from $5 all the way up to $80+, depending on the quality and where it was grown. The higher the quality, the more smooth and naturally sweet (no bitterness) and also the more vibrant the green color. I have tried all different kinds of matcha over the years, ranging from low end to high end. I personally use this matcha. I found that particular matcha green tea is a good quality without spending a fortune. It’s organic, grown in Japan and has a very pleasant, mild taste, all of which are important to me in a matcha. One bag lasts me a little over 1 month (that’s with 2 people drinking it almost every day out of the month). 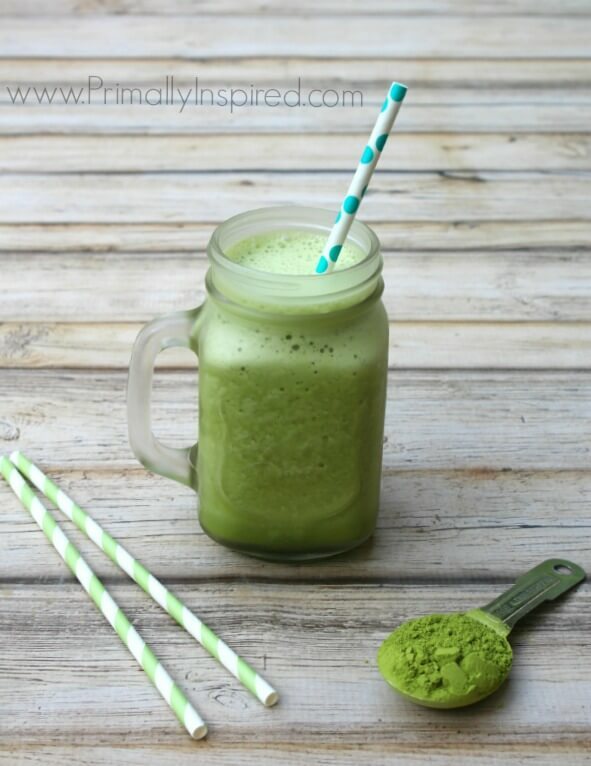 One of the benefits matcha is most known for is it’s extremely high antioxidant level. In fact, matcha contains up to 137 times more of the antioxidant EGCG than steeped green tea and has one of the highest ORAC (Oxygen Radical Absorbance Capacity) counts of all the ‘super-foods’ presently known to us! ORAC is a method of measuring antioxidant capacity and matcha has been quoted to score 1384 TE/g, which is more than Acai berries (1027 TE/g) and far more than blueberries (24 TE/g). Antioxidants are extremely important especially in this day and age because they help the body eliminate free radicals/toxins that destroy our healthy tissue and play a large part in the development of degenerative diseases. Antioxidants also play an important role in maintaining a healthy immune system. One serving of matcha provides about 35 mg of caffeine, which is less than the average cup of coffee (80-120mg). But the caffeine in matcha is a assimilated in a much healthier way than coffee due to the unique combination of phyto-nutrients in matcha. The molecules are released into the bloodstream very slowly, resulting in sustained energy for 3 to 4 hours. This prevents the insulin and adrenalin spikes that happen during coffee intake. You’ll also never experience that coffee blood sugar drop when you drink matcha! L-Theanine is the primary amino acid component of matcha. The relaxing effects of L-Theanine act against the stimulatory effects of caffeine so you won’t ever experience caffeine jitters. Instead, you’ll notice a calm alertness, relaxed mental clarity and sustained energy that lasts 3 to 4 hours. We swear by this! A study in the American Journal of Clinical Nutrition claims that matcha produces a significant boost in metabolism, combined with a significant effect on fat oxidation. “While some of the effects were originally attributed to the caffeine content in green tea, the researchers discovered that the matcha green tea effects on energy and weight loss go beyond those that would be caused by the caffeine,” says White. “In fact, they found that consuming matcha green tea can increase thermogenesis (the body’s own rate of burning calories) from a normal 8 to 10 percent of daily expenditure to between 35 and 43 percent of daily expenditure.” In other words, matcha increases your body’s ability to burn fat and calories by 4 times! Another medical study determined that drinking a cup of Matcha Green Tea before physical activity resulted in 25% more fat burning during the activity. An important note is the fact that none of the research subjects reported any side effects and no significant differences in heart rates were noticed. “In this respect, matcha green tea is different from some of the prescription drugs for obesity, and products like ephedra, which can raise heart rates and blood pressure….” says White. There are many more health benefits of matcha green tea powder like cleansing and detoxifying the blood, enhancing athletic performance, relieving rheumatoid arthritis and arthritis pain, reducing the risk of Parkinson’s disease, cancer and more. Now here’s my beloved Green Tea Frappuccino Recipe – I hope you love it and notice the wonderful health benefits and energy as much as we have! 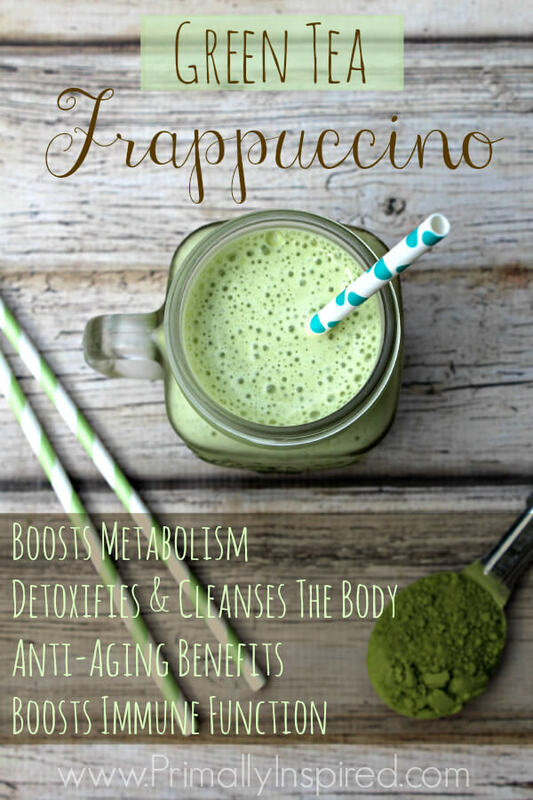 Supercharge this green tea frappuccino by adding in 1 or 2 scoops of collagen. It's amazing for anti-aging and skin health plus it helps with fat loss! It also has 18 grams of protein per 2 scoops! My favorite brand of collagen can be found HERE. Hi there! This recipe sounds awesome. I have a question – do you think you can substitute the tea powder with the tea powder found in a matcha tea bag? In other words, is the powder similar to the contents of a premade matcha tea bag? I purchased a box of matcha tea bags and was wondering if I might be able to use it for this recipe. Thank you! I just my first matcha box and this recipe sounds perfect. 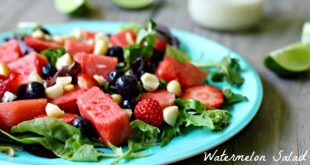 Could I substitute the coconut milk for almond milk? I can’t get coconut milk without sugar here… Thanx! My husband and I just started the whole30, would this recipe still work without the maple syrup/sweetener? He’s not a big fan of coffee and is craving an energy boost! The rest of the ingredients seem to be whole30 approved! Also, that’s a really great price on the coconut milk! We can only find it in a 13 oz can where I am in Florida. Thanks a bunch! Yes, for sure! I think you guys will enjoy this energy boost! The funny thing is when I drink the matcha warm, I actually prefer no sweetener and with nothing else added – just matcha and warm water. <<<------ Little tip that most people don't know about matcha and green tea: If you drink it hot, be sure not to boil the water because too hot of water brings out the bitter properties in the green tea. The water should be warm, not super hot and definitely not boiling. Anyway, the sweetener is definitely just an option and I think you guys will still enjoy it without it! I’m sure I’ve missed something here. Are we meant to brew the tea first? Because my 2 inches of sludge looks nothing like your glass of yummines! Hi Nicole! No, the tea isn’t brewed first. It’s more of a frozen slushie when I first make it. When I photographed this, I was outside for good lighting and it was like the hottest day of the summer and the top really melted. lol. But I’m not sure why you have sludge 🙁 Maybe you could try adding 1/4 – 1/2 cup water, blend again and see if that helps? Yummy!! I had to purchase a personal blender so I could give myself an afternoon pick-me-up while at work. As much as I LOVE my VitaMix, it’s just too darn big to carry between work and home. I made this yesterday and totally enjoyed it. I’m hoping this will help me lower my caffeine intake. I work full time and take college night classes and sometimes there’s that delicate balance between enough “energy” to last til bedtime, yet being tired enough to get to sleep at a reasonable time to start all over again the next day! Kelly, when you have a warm cup of matcha, how much do you use per how much warm water? Wow, you are busy, Trish – I think this will really help with lowering your caffeine intake. I personally love this slow and steady, focused energy 100x better than the coffee high and low. I usually use about a teaspoonful per regular size coffee mug when I take it warm. It doesn’t mix very well and you’ll probably find you’ll have to keep a spoon in it and keep stirring it. I have had this every day since you posted it, so yummy! Today I added 4 mint leaves to it, you should try it, very good!! I think that’s a great idea, June. I don’t think that we can get Matcha here in Costa Rica. I am wondering if we could use our coffee grinder or a mortar and pestle to create powder from other green tea leaves? Hi Bill, Yes that would be perfect! I’m jealous and would actually rather do it that way! Nice! I hope you like this! I have recently been getting into matcha and over Christmas tried an organic dark chocolate bar with matcha and spirulina that was heavenly and majorly energy-boosting. It inspired me to try making a hot cocoa like that and the results were amazing. Ohmigosh, I am so excited about this, Laura – thank you! This sounds right up my alley and I thank you so much for sharing your recipe!! I CANNOT WAIT to try this! 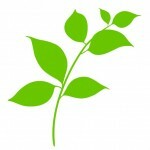 I WAS WONDERING IF MATCHA IS OKAY TO DRINK WHILE PREGNANT AND/OR BREASTFEEDING ? Hi Greta! I would check with a doctor on that. It does seem that most sources agree that 2 cups a day is ok for those pregnant/breastfeeding. An average cup of matcha has around 30mg of caffeine. This looks so yummy, Kelly. 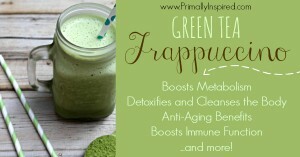 I love green tea and can’t wait to try this!! I ordered my matcha green tea and just made my first frappucino today. Mine, too, was very thick and my new VitaMix couldn’t even turn it. I was wondering if the ice and coconut milk proportions are off. I ended up using about one cup of coconut milk and then added another teaspoon of maple syrup to make it sweeter. Next time, I will use less ice and more coconut milk. I liked the flavor, but just couldn’t get it to blend…kinda like the 2″ of sludge comment you got before. I do like the taste so thanks for the great idea! 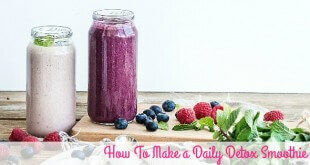 i bought the ingredients for this but your picture looks more like a smoothie or a shake. It looks creamier. I’m not liking the texture of mine. The only difference is the coconut milk. I used another organic brand. Any ideas? Hi Rosie! I’m using finely crushed ice, so that could be a possibility of why mine is looking a little creamier or smoother than yours. I’d recommend cutting the ice back to 1 cup and then adding in a 1/2 cup of water. Let me know if that helps it! I’ve read that it is not safe to drink green tea while pregnant. Do you know anything about this? Do you think it’s safe to drink matcha green tea while pregnant? Thanks! I was wondering if you could make a larger batch of this and keep in the fridge/freezer for the next day instead of making daily? So after reading through the comments I did as Kelly of Primally Inspired suggested and made crushed ice first. It took about 8 not so tiny ice cubes whipped up in the blender. Perfect! I used coconut nectar as I didn’t have any maple syrup. This is such a delicious recipe! I can’t comment as to the energy received since I’m drinking it just now but I know when summer rolls around this is going to be my morning drink instead of my ritual coffee. Thanks so much for such a great recipe!! Kayla, I love that! 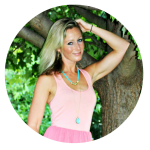 I often add cinnamon to my sweets to help combat an insulin spike (plus I just love cinnamon! ), but I never thought to add it in this. I will try it this afternoon! What a great idea! You wouldn’t by chance know how matcha tea powder rates fodmap wise, would you? I know green tea overall is low fodmap, but today is then rise if read a recipe on matcha tea powder so wasn’t quite sure of that was a different beast per say? Thanks! Hi Sabrina! I have heard matcha is low fodmap and since matcha is just milled green tea, I would think it would be low fodmap. But in my searching to locate a quick source to make sure that’s accurate, I came up short – no conflicting information – just didn’t find any charts about fodmap and matcha. I would think it would be low fodmap, but to make sure, I’d ask your doctor. I promise not to drink them all that way!!!! THANK YOU! I’ve been adding some mint and choc chips every once in awhile, too – SO YUMMY!!! I HAVE BEEN WAITING SINCE JANUARY FOR A REPLY! YOU TICKED ME OFF! Hi there, I am so sorry! I don’t see where your first question was asked, though! Gosh darn it, Herobrine1115. Get your act together. I’ve never thought to add maple syrup to my matcha tea! Great tip!! This sounds amazing! Definitely will be ordering my tea on Payday! Can’t wait for the energy boost in the middle of the day! Could I freeze it in the morning so it’s still gig around lunchtime? Or is it fine to just be in the fridge for a few hours? Hey Ashlee! The energy boost is awesommmme!!! 🙂 You could definitely freeze it in the morning – love that idea. You could also put it in the fridge, but it would most likely need to be shaken well or blended again before you drink it. Hope you love it! I just tried this with David Teas new “Mint Matcha”, and I think I have died and gone to drink heaven. I don’t know how I’m going to stop myself from making 20 a day. Oh! This sound like a lovely recipe..I am surely going to try this as soon as I lay my hands on a bag of Matcha. Matcha is not very commonly available where I stay i.e in New Delhi, however, I am sure I can look up a Japanese store or two where I hope to find this fabulous drink. Thanks for sharing! sounds good, have to try this. Love green tea. Hope you like this, Barb! My husband and I love these frappuccino’s so much! Since I usually try to give a few different ingredient options in my recipes (like different kinds of milk, different sweeteners, etc. ), those different ingredients can totally alter the nutrition profile. http://www.myfitnesspal.com is an awesome site where you can really easily type in your ingredients and it will give you the nutrition value based on the particular ingredients you used. I hope that helps! I love this recipe! Thank you so much, and also, I added two scoops of vanilla ice cream to make it creamier and more delicious! I have Matcha tea bags. I love it. I will try this recipe. Looking forward to purchasing the other before I run out of what I have. Thank you, Kelly. Enjoy, Sylvia! Matcha tea bags are great, too! I am obsessed with tea. I drink it every night religiously! I started with green tea and then started exploring. Now there is a green tea smoothie? I am all over this! 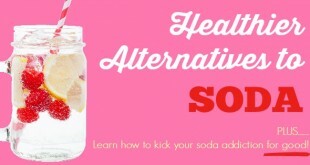 I’ve also heard of green tea and dark unsweetened cocoa smoothie! Any thoughts!? Kate, you will love this!! I sometimes put raw cacao powder in my green tea frappuccino and it’s delicious! So excited to try this! Matcha is one of my favourite things in this world, haha. Not exaggerating. I do want to mention, though, that it is extremely high in caffeine compared to other teas since the entire leaf is ground up, and can definitely give caffeine-sensitive people (like me) the jitters. It’s caffeine content is similar to coffee. If I drink matcha too many days in a row, I start experiencing violent dizzy spells, tingling, faintness, and anxiety. Took me a while to figure out the culprit, but as soon as I took a break from matcha, it went away. Just wanted to mention this in case anyone else experiences it too. BUT like I said, I love it so much that I’ll still drink it, I just have to ration it out. So I’ll be making this today for sure! Thanks, Ally! Hope you love it!